It might be thought the height of poor taste to ascribe good fortune to a healthy man with a young family struck down at the age of sixty by an incurable degenerative disorder from which he must shortly die. But there is more than one sort of luck. In 2008, historian Tony Judt learnt that he was suffering from a disease that would eventually trap his extraordinary mind in a declining and immobile body. At night, sleepless in his motionless state, he revisited the past in an effort to keep himself sane, and his dictated essays form a memoir unlike any you have read before. 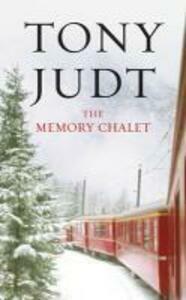 Each one charts some experience or remembrance of the past through the sieve of Tony Judt's prodigious mind. His youthful love of a particular London bus route evolves into a reflection on public civility and interwar urban planning. Memories of the 1968 student riots of Paris meander through the sexual politics of Europe, a series of roadtrips across America lead not just to an appreciation of American history, but to an eventual acquisition of citizenship. And everything is as simply and beautifully arranged as a Swiss chalet - a reassuring refuge deep in the mountains of memory.